A peak into an underground fight club, where four fighters brawl, no hold barred. A free for all melee and their attempt to leave a legacy; an opportunity to not be forgotten. We decided to reverse engineer our typical creative process, in an attempt to challenge ourselves and to approach from a fresh perspective. We worked with our friends in the band VanLadyLove to completely record and engineer a song entirely with Rode Mics, which is uncommon. 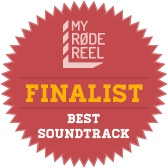 The song was also written for the sole purpose of being a soundtrack for this competition. We used Rode's NT5, NT1, K2, Procaster, and the VideoMic Pro Compact Shotgun.